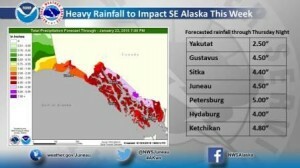 With already unusually warm temperatures and above average rainfall in recent months, forecasters are warning this latest system is going to increase the chance for landslides and mudslides throughout the region, says warning coordination meteorologist Joel Curtis in with the National Weather Service in Juneau. “We’ve had a moist flow aimed at us for most of the winter so far and then this thing is just putting more rain on top of that. We just have a real ‘watch out’ condition,” Curtis says. He issued the first warning for landslides on Monday night. He is forecasting most areas of Southeast will get up to an inch and half of rain Tuesday followed by up to two inches overnight and more on Wednesday. The system will also bring high winds, expected to reach 40 to 50 miles per hour in many areas. Curtis says with soils already saturated and high winds forecasted conditions are ripe for landslides. He says with such a large system, it’s difficult to be precise about what areas are most susceptible to landslides. Curtis says the alerts will be updated as the impending weather system moves over the panhandle. He says the only region of Southeast not included in the landslide warning at this time the Yakutak area. On Tuesday, the Haines and Skagway area was also forecasted to get several inches of snow along the Haines Highway and up to a foot and a half of snow was expected along the Klondike highway. For the most up-to-date weather information, visit the National Weather Service.